Explanation: On October 10, a new telescope reflected the light of the setting Sun. With dark horizon above and sunset colors below, its segmented mirror inverts an image of the beautiful evening sky in this snapshot from the Roque del Los Muchachos Observatory on the Canary Island of La Palma. The mirror segments cover a 23 meter diameter and are mounted in the open structure of the Large Scale Telescope 1, inaugurated as the first component of the Cherenkov Telescope Array (CTA). Most ground-based telescopes are hindered by the atmosphere that blurs, scatters, and absorbs light. But cherenkov telescopes are designed to detect very high energy gamma rays and actually require the atmosphere to operate. As the gamma rays impact the upper atmosphere they produce air showers of high-energy particles. A large, fast camera at the common focus images the brief flashes of optical light, called Cherenkov light, created by the air shower particles. The flashes reveal the incoming gamma ray timing, direction, and energy. Ultimately more than 100 Cherenkov telescopes are planned for the CTA at locations in both northern and southern hemispheres on planet Earth. That instrument may detect gamma rays, but it's still an optical telescope, with lage mirrors to collect and reflect the light to a focus. So how can it be mounted naked, no protection from rain or dust? I think it uses invisible forcefields. Neither rain nor dust are particularly harmful to aluminized and coated optics. These telescopes are located where the rain doesn't contain many pollutants that could produce acids or mineral deposits, and dust has minimal optical impact. The mirrors will no doubt be cleaned from time to time, and maybe recoated every few years, as is typical with most optical telescopes. It's a very nice looking mirror array, and gives a beautiful reflection of the evening sky. Can someone help this neophyte with a couple of questions? Why is one mirror panel missing in the middle of the array? What is the design idea behind the large metal loop that goes between the mirror and the stand at the right and all the spider-web-like lines between it and the stands next to the mirror base? (In a small image, it all looks a lot like a humorously huge extension chord and plug.) Does this structure move the mirror? EDIT: Ah. That box at the right of the "loop" is the focal point, right? And it houses the detectors. And whatever does move the mirror, that focal point has to move with it. I get part of it, then. The box at the end of the "loop" is, indeed, the focal point that houses almost 2 tons of detectors. The long "loop" plus detectors has its combined center of gravity way back at the main mirror (axis) for balance. A mirror segment in the full shadow of the large detector house would be rather superfluous. The LST Camera shares many elements with the NectarCAM for the MSTs. It has a weight of less than two tonnes, a total number of channels of 1,855 divided into 265 photomultiplier tube (PMT) modules that are easy to access and maintain. PMTs with a peak quantum efficiency of 42 percent are used as photosensors to convert the light into electrical signals. To maximize the light throughput, each photosensor is equipped with an optical light concentrator, optimized for the field of view and geometry of the photosensor. Well, the middle mirror would contribute no signal to the camera, since it is completely shadowed by that camera. So why have it? And while I don't know if they're using that aperture for anything, I can imagine it might be useful for managing collimation or other optical and mechanical aspects of the telescope (that is, the camera could be monitored from behind the primary). Thank you, Chris! It looked so incongruous, naked on the mountainside! Thanks. So, is this a silly suggestion ... why don't they just angle the mirrors a little and make the focal point a little off to the side? Then they could also collect the light at that central location. The question becomes one of very basic telescope design, so I'm sure you have an answer for it ... is it better to deal with that central shadow in your image than it is to deal with the image distortion and possible reduction in quality that would result from angling the reflection off-center of a paraboloid? It is a LOT easier, and therefore a lot less expensive, to make symmetrical optics. Every mirror is the same (or possibly, rings are the same), rather than each requiring a different figure. The camera blocks just a few percent of the total light. Almost every large optical telescope in the world has a large central obstruction. <<The Large Synoptic Survey Telescope (LSST) is a wide-field survey reflecting telescope with an 8.4-meter primary mirror, currently under construction, that will photograph the entire available sky every few nights. The telescope uses a novel 3-mirror design, a variant of three-mirror anastigmat, which allows a compact telescope to deliver sharp images over a very wide 3.5-degree diameter field of view. Images will be recorded by a 3.2-gigapixel CCD imaging camera, the largest digital camera ever constructed. The telescope is located on the El Peñón peak of Cerro Pachón, a 2,682-meter-high mountain in Coquimbo Region, in northern Chile, alongside the existing Gemini South and Southern Astrophysical Research Telescopes. 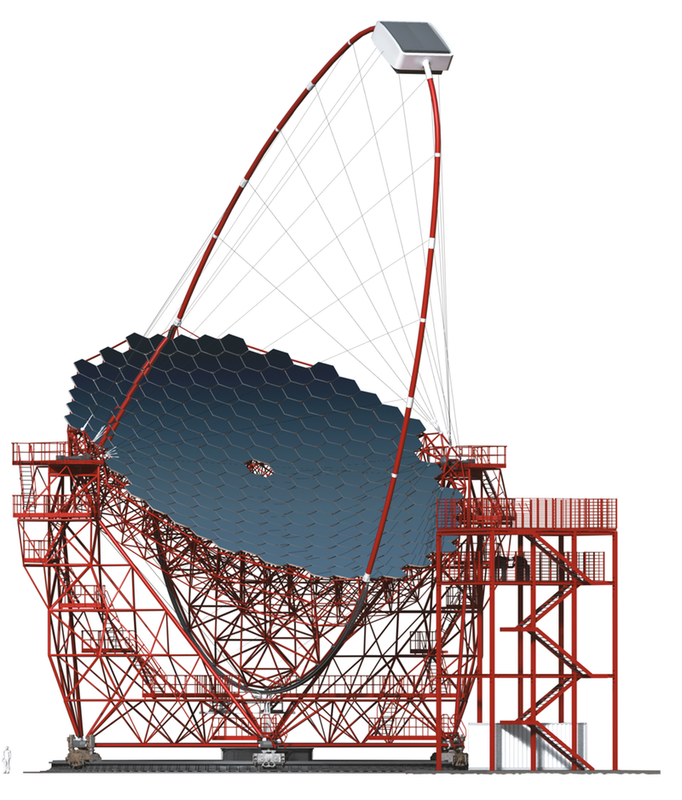 The LSST is the latest in a long line of improvements giving telescopes larger fields of view. The earliest reflecting telescopes used spherical mirrors, which although easy to fabricate and test, suffer from spherical aberration; a very long focal length was needed to reduce spherical aberration to a tolerable level. Making the primary mirror parabolic removes spherical aberration on-axis, but the field of view is then limited by off-axis coma. Such a parabolic primary, with either a prime or Cassegrain focus, was the most common optical design up through the Hale telescope in 1949. After that, telescopes used mostly the Ritchey–Chrétien design, which uses two hyperbolic mirrors to remove both spherical aberration and coma, leaving only astigmatism, giving a wider useful field of view. Most large telescopes since the Hale use this design—the Hubble and Keck telescopes are Ritchey–Chrétien, for example. LSST will use a three-mirror anastigmat to cancel astigmatism: three non-spherical mirrors. The result is sharp images over a very wide field of view, but at the expense of light-gathering power as the large second mirror blocks much of the aperture of the telescope. The LSST primary mirror (M1) is 8.4 meters in diameter, the secondary mirror (M2) is 3.4 meters in diameter, and the tertiary mirror (M3), inside the ring-like primary, is 5.0 meters in diameter. The second and third mirrors reduce the primary mirror's light-collecting area to 35 square meters, equivalent to a 6.68-meter-diameter telescope. The primary and tertiary mirrors (M1 and M3) are designed as a single piece of glass, the "M1M3 monolith". Placing the two mirrors in the same location minimizes the overall length of the telescope, making it easier to reorient quickly. Making them out of the same piece of glass results in a stiffer structure than two separate mirrors, contributing to rapid settling after motion. The hole in the telescope axis hosts several lasers and cameras monitoring the deformations of the mirror, deviations from the source as wind can be an issue, calibrateing the intensity of the Cherenkov light, etc. A symmetric structure is simpler as mirror facets are spherical with different radii. This reduces the number of mirror versions. It is also more stable and easier to control from the mechanical point of view. Finally, the IACT telescopes usually observe in the so-called wobble mode. They do not point towards the source but to a position with a certain offset from the source, actually to a set of such positions around the source, during the observation slot. This way the telescope can simultaneously observe the source and a background, used to discriminate gamma rays from cosmic rays.